The first semi-finalists in the Women’s Singles event at the Seamaster 2018 ITTF World Tour Asarel Bulgaria Open in Panagyurishte determined; on the evening of Friday 17th August the decision went in favour one player who extols the defensive art, the other of a total different style, one who favours the fast close to the table attacking style. Japan’s Hitomi Sato and China’s Wang Yidi were the players to emerge successful. Hitomi Sato, the no.3 seed, used her classical backspin style of play to overcome Hungary’s Georgina Pota, the no.13 seed (11-9, 11-5, 11-5, 11-7) and thus to some extent avenged the defeat colleague Saki Shibata had experienced at the hands of the 33 year old from Budapest, one round earlier (11-9, 2-11, 11-8, 9-11, 11-9, 12-10) . Georgina Pota is now one of the more experienced players on the international scene. She is one of the few who remain from those who played in the first ever World Junior Championships staged in the Chilean capital city of Santiago in 2003. 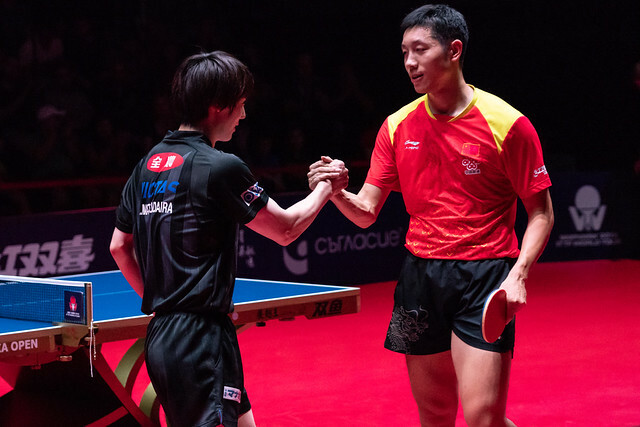 Notably it was the third time in a world ranking event that Hitomi Sato and Georgina Pota had met; at ITTF Challenge Series tournaments, they met in 2017 in Otocec, Slovenia and earlier this year in the Spanish city of Guadalajara. Both verdicts went in favour of Hitomi Sato but the duel earlier this year in Spain was much closer than in Panagyurishte; they met at the semi-final stage of the Women’s Singles event, a full distance verdict being the outcome (11-6, 10-12, 8-11, 13-11, 13-15, 11-7, 11-8). Furthermore, in Panagyurishte, perhaps in the second round Georgina Pota did Hitomi Sato a favour; in the final in Spain, Hitomi Sato lost to Saki Shibata. A relatively comfortable success for Hitomi Sato; for Wang Yidi against compatriot and fellow qualifier, life was more fraught. Winner of the Under 21 Women’s Singles event two days earlier, Wang Yidi needed the full seven games to secure victory (11-9, 11-5, 7-11, 9-11, 11-8, 9-11, 11-6). Hitomi Sato and Wang Yidi now meet in the semi-finals; the match is to be played on Saturday 18th August.